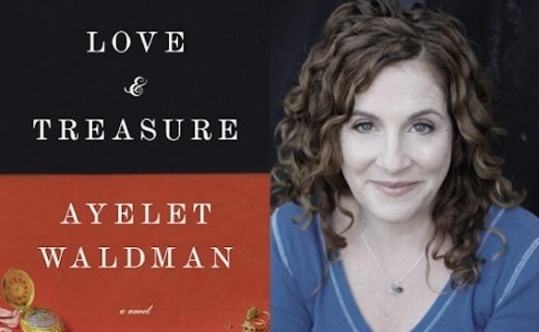 I devoured all 331 pages of Ayelet Waldman's gripping and powerful novel Love and Treasure (Alfred A. Knopf) in one 14-hour marathon on my flight from Los Angeles to Israel. Before the El Al plane made its descent into Ben Gurion Airport, I began this review with Waldman's interview with Carolyn Kellogg for the Los Angeles Times in which Waldman muses that "people who read me expecting they're going to get in-your-face sassy funny" might be "a little taken aback," after reading Love and Treasure. In her fantasy, Waldman adds, "People who read me thinking that then think, 'Oh wow, she can really write." Well, Ms. Waldman, you can really write, and write brilliantly. In one of the most poignant scenes in Love and Treasure, we are told that 18,700 of the 19,000 Jewish Holocaust survivors, who planned to immigrate to Palestine and had to fill out a questionnaire, listed Palestine as their first and second choice. Not only that, but in the Furth displaced persons (DP) camp near Nuremberg, when a United Nations Relief and Rehabilitation Administration worker said "they must put a different destination for their second choice, a quarter of the DPs filled in the word 'crematorium.' "
Today, more than 70 years after Hitler unleashed his wrath on European Jews, anti-Semitism is on the rise again in France, so much so that the number of French immigrants to Israel is at a record high. What then, one can't help but wonder, would have happened to Jews around the world if the might of the Israeli army did not exist as a deterrent? The story moves seamlessly from 2013 in Maine, to March 1938, when Hitler invaded Austria, to 1945, and back to 2013 in Budapest and Israel, unfolding against the backdrop of monumental historical events that changed the face of Europe and hastened the creation of the State of Israel. In 1945, after World War II, at the outskirts of Salzburg, Austria, Jack Wiseman, an American lieutenant, is ordered to guard the Hungarian Gold Train filled with crates of personal belongings -- silverware, china, sheets, watches, fur coats, wedding rings, coins -- confiscated from Hungarian Jews who perished in concentration camps. As anyone who has visited Yad Vashem in Israel or the United States Holocaust Memorial Museum in Washington, D.C., can attest, coming face to face with such personal belongings, such as a single red, rhinestone-buckled evening shoe among a mountain of dark-colored shoes, is a heart-wrenching experience. Was the owner of the red, satin shoe on her way to the opera when the Gestapo descended on her? One such a personal item, an enamel pendant in the shape of a peacock -- a symbol of bad luck -- is at the center of Waldman's novel that brings a cast of disparate characters together to retell history in a fresh and engaging manner. While on duty listing the train's cargo, Jack falls in love with Ilona Jakab, a Hungarian refugee and survivor of Auschwitz and Dachau. The tormented, but still passionate Ilona, succeeds to tease out Jack's connection to his heritage and make it difficult for him to keep silent as his superiors go about borrowing all types of objects from the train for their personal use, never to be returned. Jack himself, though, in hope of securing something to remind him of Ilona, steals the peacock pendant from the train. Sixty-eight years later, in 2013, the dying Jack returns home to Maine. He recounts to his granddaughter, Natalie, the story of his youth in the army after the war, his love for Ilona and how he came to own the peacock pendant. Plagued by guilt, Jack extracts a promise from Natalie to return the pendant to its rightful owner. In her quest to honor her grandfather's request, Natalie, who is reeling from a recent divorce, meets Amitai Shasho, an Israeli art dealer who hunts for stolen paintings, returning them to their previous owners in exchange for a substantial commission. Amitai, who has been searching for a Hungarian painting of a woman with the head of a peacock, agrees to help Natalie trace the pendant to its owner. After much traveling and tremendous research, Natalie and Amitai manage to connect the pendant to Nina S., a defiant intellectual, and her friend, Gizella Weisz, a suffragist dwarf, living in Budapest during World War I, at a time Jews were highly assimilated into the culture. But whom does the pendant belong to if the heirs are long gone? It would be a mistake to call Love and Treasure a Holocaust novel, although it is that, too. More than anything, this is a tale of hope and the unbreakable spirit of a people, the transformative power of love and the miracle of the birth of Eretz Israel.